My process is a technique often called neriage (nair-ee-ah-ghee) or nerikomi (nair-ee-comb-ee) from the Japanese tradition. 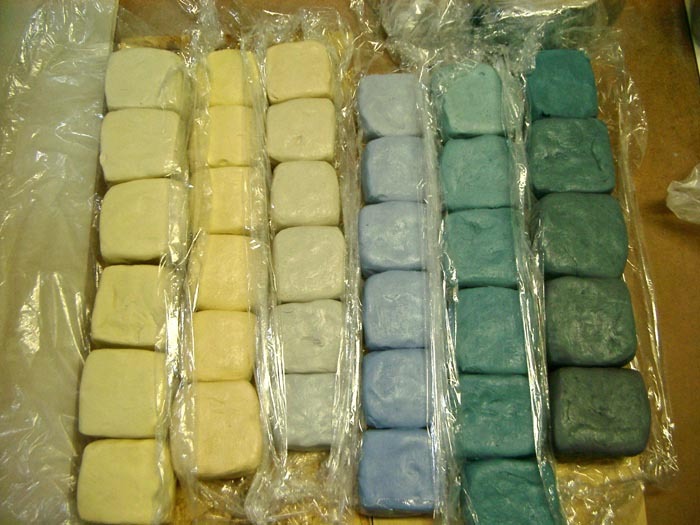 It is a process akin to murrine in glass making. 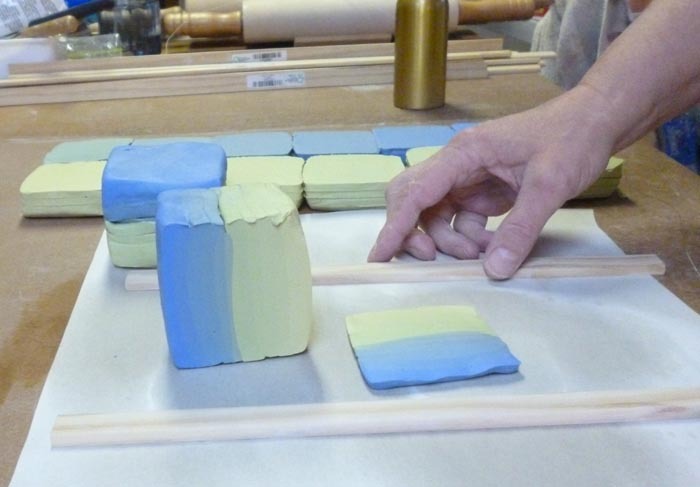 A pattern is created by joining differently colored clays into a loaf or block which is sliced to reveal the pattern in the cross section. 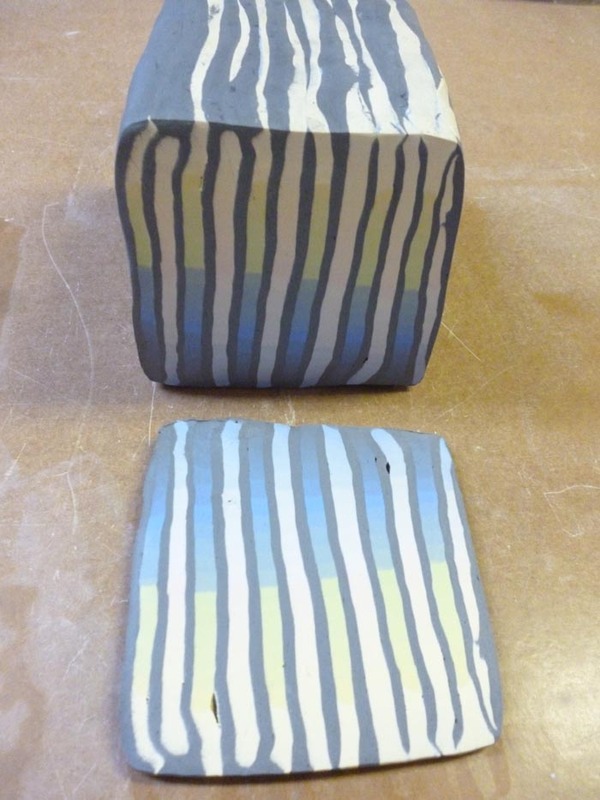 I have selected a series of images of me making a patterned block with a description of some of the steps in my process. 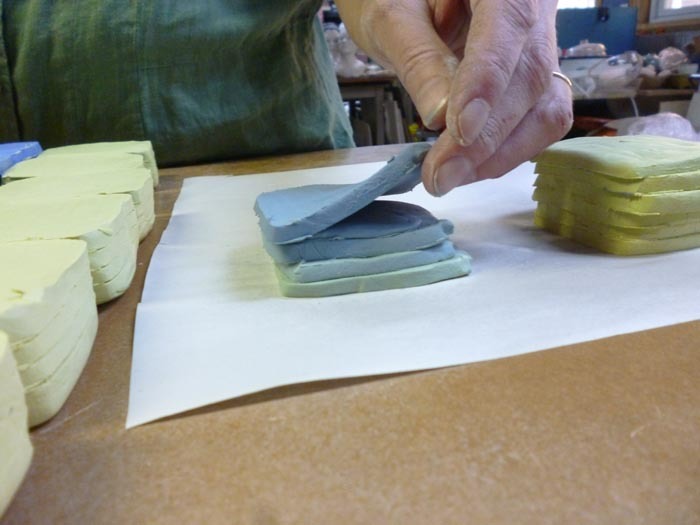 I wedge colorants onto the moist white clay to produce a variety of colors. 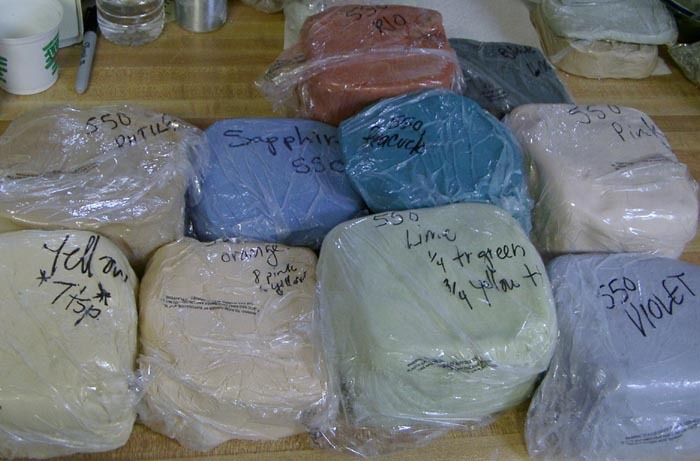 I blend small amounts of one color with another color to create the color gradations you see here. 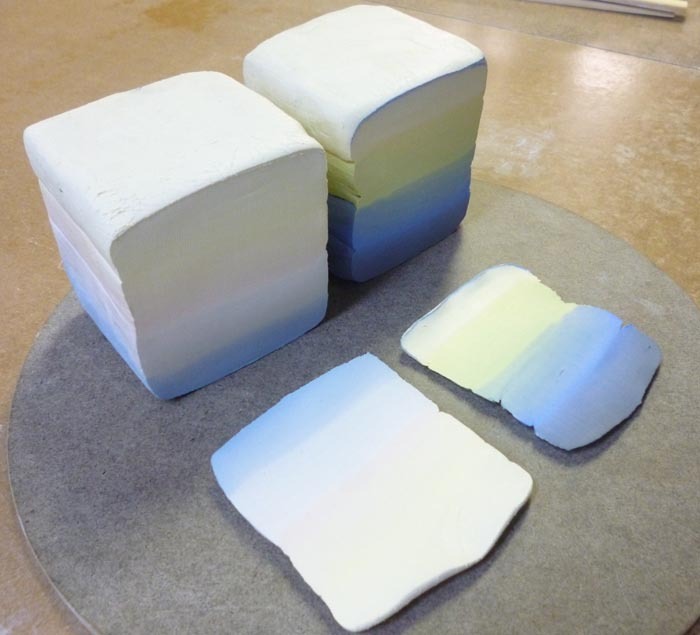 Here I am stacking the gradation slices in order. 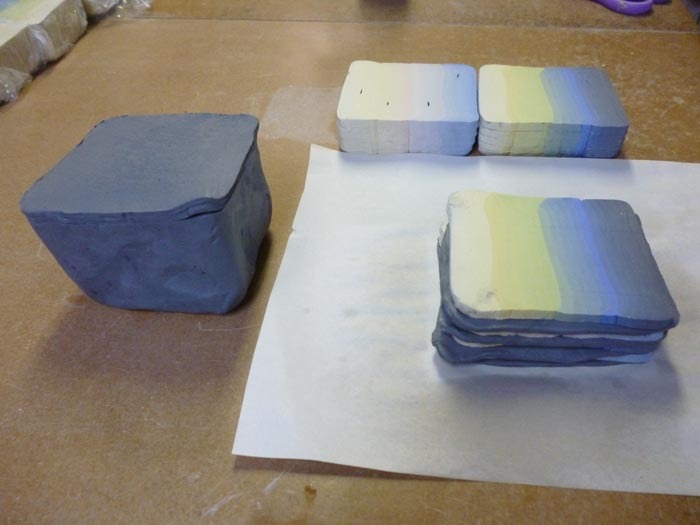 Here I have 2 color gradations stacked and ready to use. 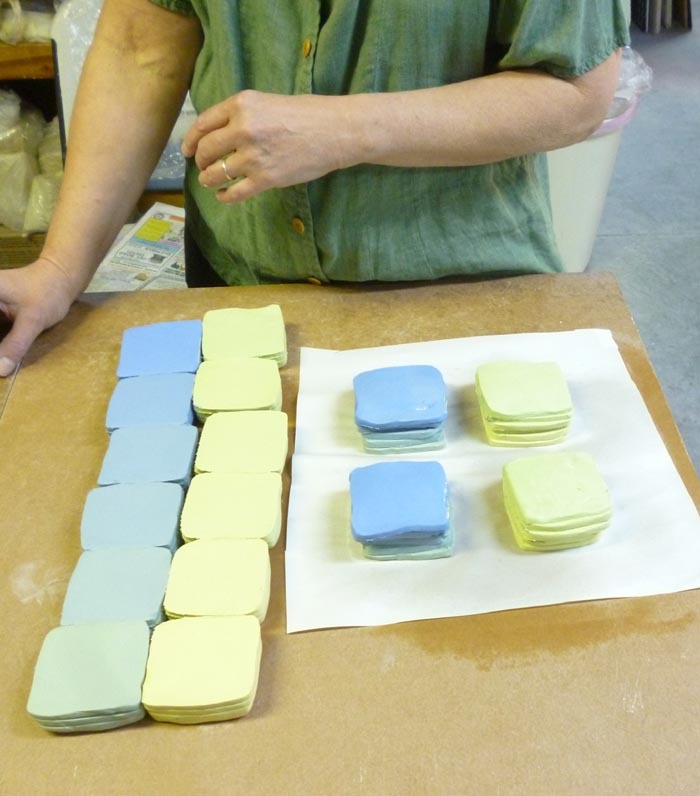 Here I am combining the 2 color gradations to create 2 layers of gradations. 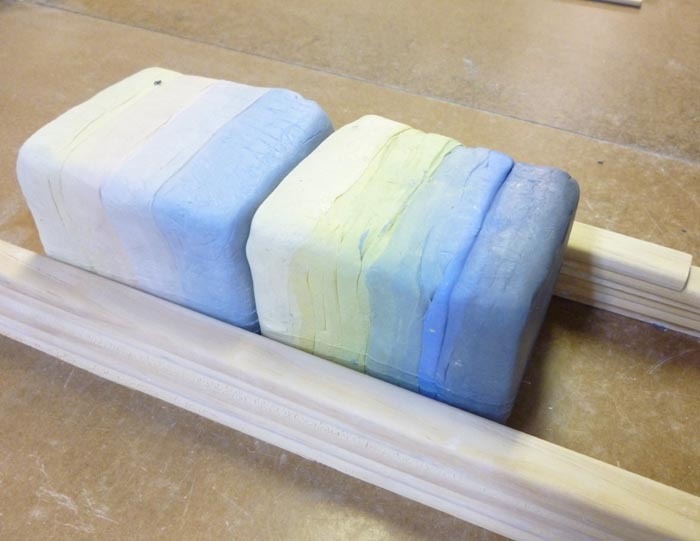 Here is a slice showing the cross section of the layered gradations put together. By combining multiple layers of gradations I can create a soft blending from one color into the next for interesting visual effects. 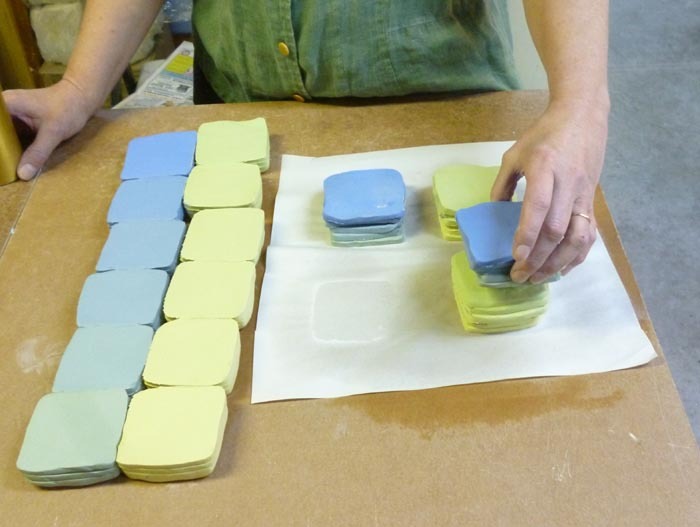 In this image I am cutting slices from 2 different multiple stacks of color gradations. 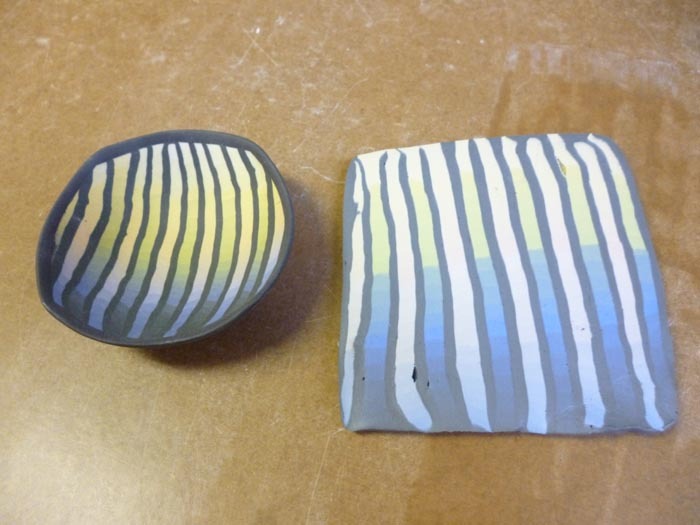 For this pattern I will add a slice of black clay between each color gradation slice. 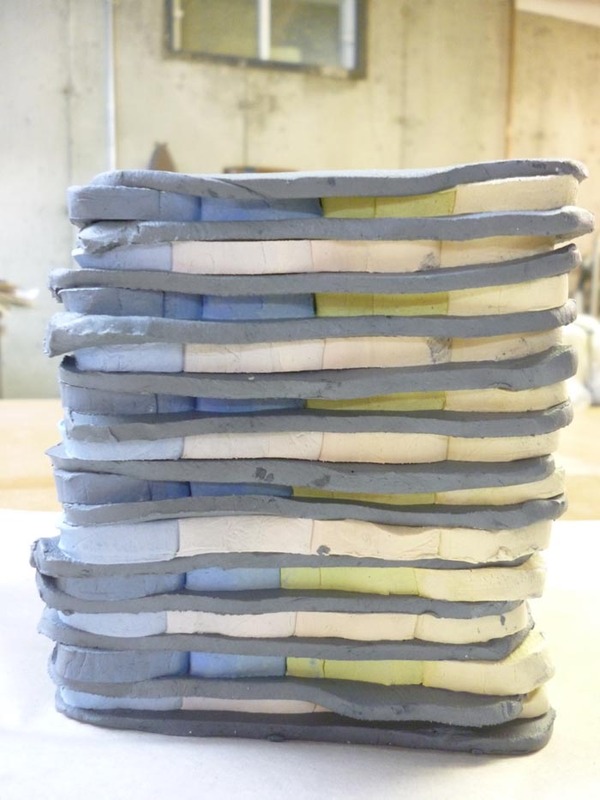 Here are all the slices stacked up. Here is a slice showing the cross section of the finished patterned block. I use the slices to create my slab built pots. The finished slice with a bowl that has been fired to cone 8 in oxidation. Before the pots go into the kiln to be fired, when they are bone dry and very fragile, I carefully clean up the surfaces of every pot. 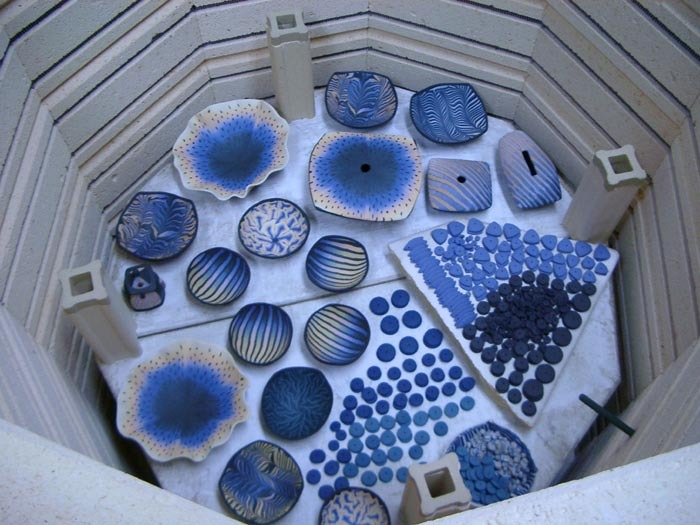 A view inside the kiln! 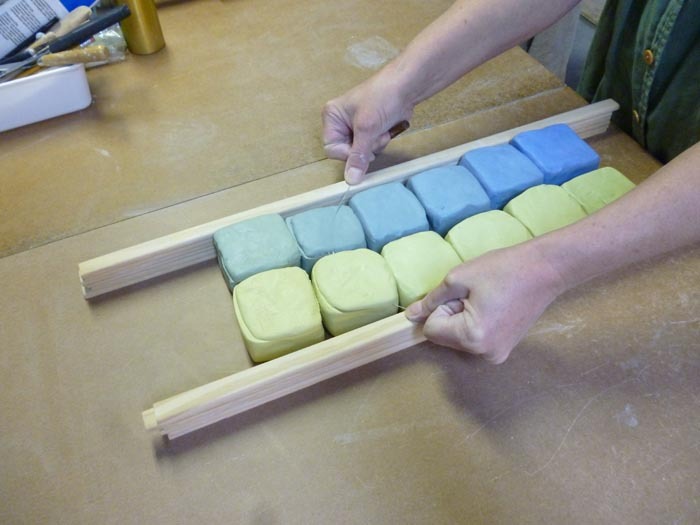 By varying the colors and arrangements I can create an endless variety of patterned blocks to make my slab built pots. Some of my patterns have over 100 layers of color in them. 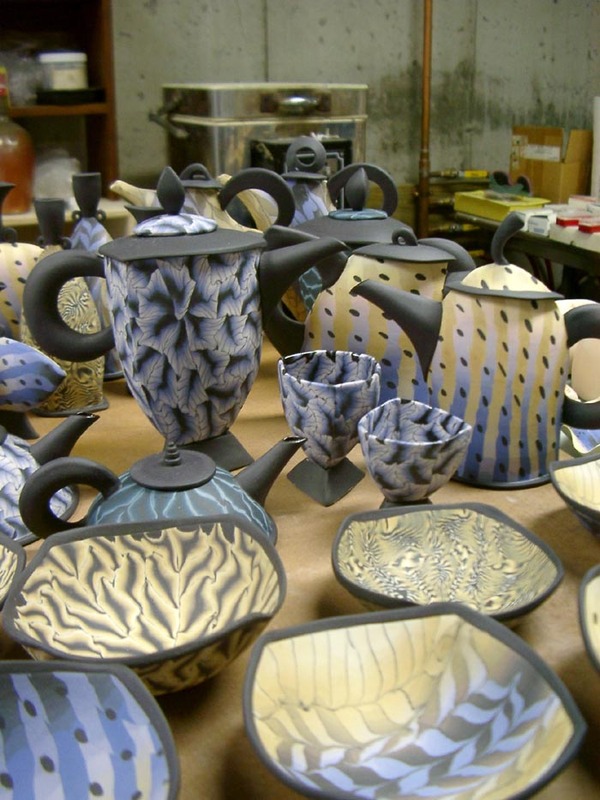 Pots just unloaded from the kiln! Thanks for your interest in my process. If you are interested in having me teach a workshop please contact me.